The Med Sketch app for iPhone, iPad, and iPod Touch makes it easy for those of us who don’t speak medical jargon to understand what’s going on in our bodies when we get our conditions diagnosed. If your doc has ever used a word you didn’t understand to describe a condition you’ve never heard of on a body part you never knew you had – then this app is a must for you. If you are the doctor – then Med Sketch is a priceless tool for teaching your patients about their conditions. The Med Sketch app contains a set of visually detailed and engaging diagrams for all major external and internal organs and body parts. As soon as you make a patient diagnosis, you can whip out this app and scan down the list and bring up an image of the body part of the patient that needs attention. Let’s say your patient has a bowel obstruction. In seconds you can pull up a detailed picture of the intestines for your patient. You can then use the tip of your finger to draw circles, arrows, and figures, etc., on the pic to help both explain the condition and pinpoint its exact location within your patient’s body. Now your patient has a visual understanding of their condition to go with your verbal explanation. If you’re in need of medical care, bring the app to the exam room with you. Have the docs show you an image of the body part you’re concerned with and ask them to explain your condition, using the sketching tool if necessary. 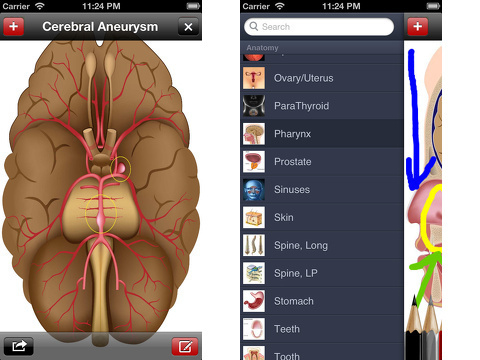 The Med Sketch app is potentially simple and easy to use. I say potentially, because it needs a zoom feature that can zero in on specific body parts for images that include multiple body parts. For instance, one diagram shows the upper body including the head, arms and torso. I tried to zoom in on the hand area, but it was a no-go. Instead, my finger movements resulted in a messy sketch on the image that I hadn’t intended. It makes more sense to offer an image movement/zoom-feature and then require the user to touch the sketch button before the sketching feature is engaged. The app is easy enough to use, although much of its touted functionality is lacking. Under the Tips and Tricks Menu (which is hard to locate as you must scroll down through the entire picture collection before you get to it) advice is given on how to navigate the app, but only one of the tips worked for me. The Med Sketch app is a potential game-changer in the world of health care – it bridges the gap between doctor-speak and patient-understanding. When I can see what’s going on in my body, it’s easier for me to understand why I need to take care of it and how important it is to do what it takes to become healthy again. Med Sketch only needs a couple of tweaks to take it from a great app to an amazing one. 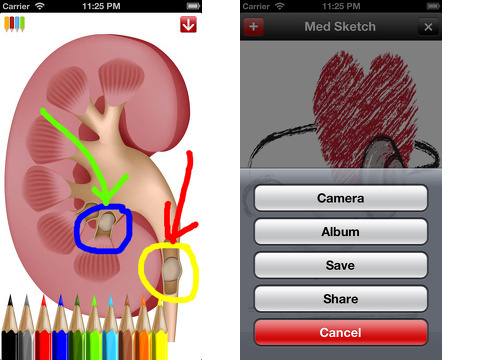 AppSafari review of Med Sketch: Anatomy Drawing App was written by Stephanie Quinlan on August 26th, 2013 and categorized under App Store, Education, Health, Reference, Utilities. Page viewed 4112 times, 1 so far today. Need help on using these apps? Please read the Help Page.